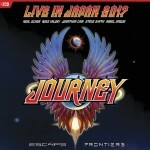 Share the post "Album review: JOURNEY – Live In Japan 2017: Escape + Frontiers"
In 2017 Journey played the Budokan arena in Japan for a special show where they played two of their classic albums – 1981′s ‘Escape’ and 1983′s ‘Frontiers’ – in their entirety and recorded the show, which we now have here as a double CD and DVD package. The band include all of the line-up (guitarist Neal Schon, drummer Steve Smith, bassist Ross Valroy and Jonathan Cain on keyboards) that recorded both albums originally, bar vocalist Steve Perry. Arnel Pineda is the current vocalist and he is more than capable of doing these Journey classics justice. The setlist holds few surprises, although with the ‘Escape’ album being performed first you have arguably the band’s biggest song ‘Don’t Stop Believin’ played as the opener, after a short intro. Travis Thibodaux played keyboards and added backing vocals, which allowed Jonathan Cain to play rhythm guitar and add some extra crunch to the band’s rockier numbers like ‘Stone In Love’ and ‘Lay It Down’. Drummer Steve Smith, who returned to the band in 2016, actually performs a bearable drum solo that leads into ‘Back Talk’, not one of the best songs on the ‘Frontiers’ album and no real surprise the band haven’t played it live much. Jonathan Cain gives an intro ‘Faithfully’, both about how the song came to be written and his own little piano solo, before the familiar opening piano chords send the crowd wild. The whole band seemed to be on good form, with the DVD showing that the band are all about the music and not one for spectacular stage sets or lighting/pyros. The DVD in particular shows how much emotion Arnel Pineda pours into the songs. The only real surprise is ‘La Raza Del Sol’, originally a B-side to ‘Still They Ride’, extended to an epic jam session as Neal Schon taps into his Santana side of playing. ‘Lovin’, Touchin’, Squeezin’ brings the show to a rousing finale. This entry was posted in ALBUM REVIEWS, ALBUM REVIEWS (Mobile), All Posts, DVD REVIEWS and tagged album, AOR, Arnel Pineda, classic album, classic rock, DVD, Escape, Frontiers, Journey, melodic rock, Neal Schon, review. Bookmark the permalink.